Until I pulled out my spool knitter! I was able to do it while laying on the couch watching TV. Once you know how to do it there's really very little thought that has to go into it and the end result is usually something both beautiful and useful! So, here's one last spool knitting video for the year. 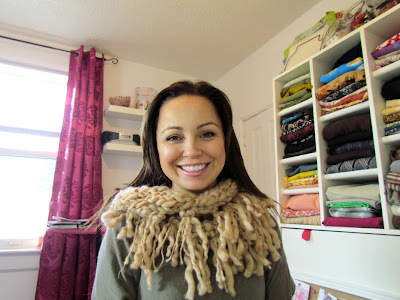 In this one I also show you how to make and add fringe to your project. If you're new to the series you can learn how to make your own spool knitter here , learn the basics here, and catch up on fun spool knitting projects here and here . I can't believe I haven't tried this yet. Your cowls are so gorgeous. I love it !! it looks Fantastic. And you are great on camera!! Simply beautiful! This is perfect:) I am seriously loving your post (and your entire blog for that matter)! It is so informative and inspirational. I think my subscribers would really enjoy reading this. I would love for you to come share it at Frugal Days, Sustainable Ways on Frugally Sustainable (http://frugallysustainable.blogspot.com/2011/11/frugal-days-sustainable-ways-3.html). I really hope that you will put Frugal Days, Sustainable Ways on your list of carnivals to visit and link to each Wednesday! This is great! I have a craft/recipe linky going on and would love for you to stop by & link up if you have the chance. Thanks! Where can I find out how to make a spool? I love the cowl... It's beautiful!